Piovan’s Digitemp Thermorefrigerators are a new solution of water-cooled chillers that yield maximum cooling with minimum energy consumption. 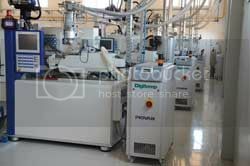 Available in three models in the single or dual circuit versions, and designed especially for injection and blow-moulding machines, the Digitemp units supply water at a specific temperature, pressure and flow rate, performing the dual function of heating and cooling the process circuit. The Digitemp units, because of their -5 degrees C to a maximum of 90 degrees C per circuit working range features suit all those applications that require flexible management of the different temperature requirements of each processing machine. The main characteristic of Piovan thermorefrigerators is their digital scroll compressor, which ensures exceptional performance while maintaining very low energy consumption, in comparison with other units currently on the market. This type of compressor has the advantage of being able to work continuously and reduce the cooling capacity from 10 to 100%. The result is careful and optimised use of energy - which varies according to the cooling power/thermal yield - but also a more precise temperature control, with no fluctuations, in comparison with compressors of the traditional type. In addition, the use of the electronic expansion valve, included in the standard configuration, and of only one pump per circuit, further enhances the energy efficiency of the Digitemp units. The exclusive construction features of the Piovan range, DT thermorefrigerators ensure an overall energy saving from 30 to 50% compared to equivalent models already on the market. Lastly the possibility of integrating the free-cooling system in the unit for supplying water from a dry cooler or a cooling tower, even in the presence of glycol, permits even greater energy efficiency and as well a reduction of the running costs. A space-saver because of its compact design, the Digitemp range takes up only 0.4 m² floor space and a height of 108 cm. Moreover, the units’ dimensions simplify installation and save production space.